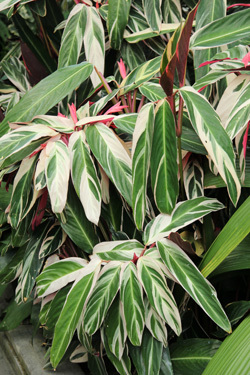 Tricolor is a stunning tropical foliage plant. 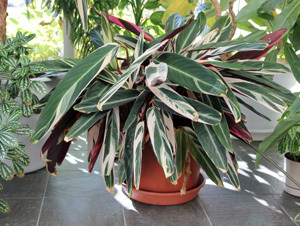 Stomanthe sanguinea “Tricolor” is a stunning selection of a tropical herbaceous perennial in the maranta or prayer plant family (Marantaceae) with dramatic, multicolored leaves. Native to rain forests of Brazil, it requires high humidity and warm temperatures to thrive. Once just an uncommon landscape plant in zones 9-11 (or a curiosity for greenhouse growers), this relative of the prayer plant (Maranta species) is becoming more common as an unusual houseplant or seasonal annual in the Midwest grown for its fabulous foliage. This plant has some issues with its name: the true cultivar is actually ‘Triostar’, but typically is marketed under the name “Tricolor” and the species name was technically changed to S. thalia, but this is rarely seen in the trade. There is another similar plant, Ctenanthe oppenheimiana, with a variegated clone called ‘Tricolor,’ but that plant is less common, has different leaf shape, markings and venation and thinner, wirier petioles than S. sanguinea and is not as cold tolerant as S. sanguinea. Both the upper (L) and lower (R) leaf surfaces are quite colorful. S. sanguinea has thick, glossy, oblong leaves with entire margins that are a dark green color on top and burgundy below. 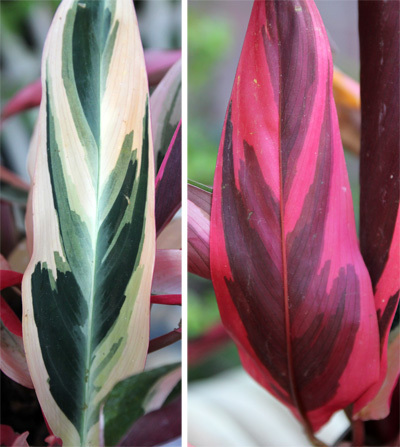 The leaves of Tricolor have irregular variegations in cream, pink, and green on the upper surface and are either a solid pink to burgundy or maroon with pink variegation on the lower surface. The amount of variegation varies considerably, with some plants – or just some leaves on a plant – nearly all cream, while other leaves have green bands of various widths, to nearly completely green with just a few creamy streaks. The petioles are a pink or burgundy as well. S. sanguinea has short, creeping stems that can grow up to 5 feet tall under ideal conditions, but this cultivar remains much shorter (18-30 inches), especially when grown in a container. The 6-12 inch long leaves arise on long petioles from the crown of the plant. Each leaf has a mechanism (the pulvinus) for orienting the blade toward or away from the sun. The leaves fold up at night, making the rosy pink undersides more noticeable. By morning they face to the east so they will catch more of the early morning sun, but by midday, they move to a more upright position so less of the blade is exposed to the intense sun. Flowers are rarely produced on Tricolor grown as a houseplant. In its native habitat, panicles of white or pink flowers surrounded by tubular orange-red bracts which age to a reddish pink are produced in winter and spring. These tight, pendulous clusters held above the foliage are sometimes seen on plants grown in greenhouses. The colorful red-orange flowers (really bracts surrounding the pink flowers) are rarely produced when grown as a houseplant or seasonal annual. Tricolor can be used as an exotic addition to an annual bed for a tropical effect, or as a dramatic specimen in a container. If you have the appropriate conditions indoors, it makes a stunning houseplant. Grow Tricolor as a container plant in any quality soilless growing medium. The medium should be kept evenly moist during the growing season, but allowed to dry a little more between waterings in the cooler, darker months indoors. 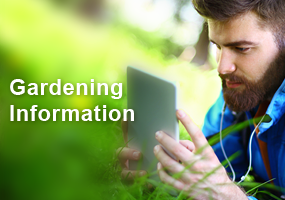 Fertilize periodically during the growing season only. Tricolor makes a dramatic container specimen for indoors or outdoors during warmer weather. Most members of the maranta family suffer whenever temperatures fall below 60F, but this species tolerates temperatures down to 40, and outdoors the species has come back from below freezing temperatures (although the leaves are killed and the variegated form is a little less hardy). 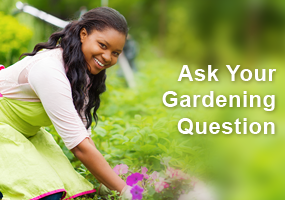 However, it still prefers warm temperatures (above 65F) and requires adequate humidity – which can be difficult to provide in most homes during the winter – or the leaves with dry out, starting along the edges. In the Midwest the plants will tolerate full sun as long as they receive adequate water, but can also be grown in part shade. Keep the plant in bright light for the best color development, although the plants will grow well in lower light conditions. Snip off any dried or unsightly leaves. Propagate by division of the clumps, preferably in the spring before new growth starts. 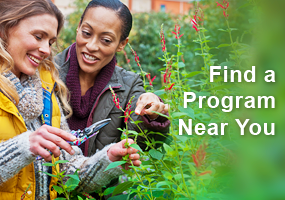 If moved outdoors for the summer, gradually increase exposure to the elements in the spring, waiting until all danger of frost has passed before leaving outside. In the fall the plant should be moved back indoors before frost. I grow these as a foundation planting on the north side of my house in central, east coast Florida. (Zone 9B) They do well in the shady, but brightly lit area. They are not cold tolerant. I cover them with sheets any time the temperature will be near 32 degrees (not very often) In the winter of 2017-2018 we had a lot of cold weather (several days below 30 degrees) and the foliage was killed. I cut them back to the ground and by July they looked like normal again. In a normal winter, I can expect a few damaged leaves, I just trim those out. The plants grow quickly in warm weather. They are very attractive and colorful, one of the few really colorful plants for shady areas. i have had one plant for several years. keep it outside in the summer and in a south window in the winter. It gets watered when I think of it, etc. It grows beautifully with a sometimes removal of a dry leaf here and there. It has bloomed three times on tall stalks. I have left them on but they are ungainly. Can I just cut them off? Can you take the creeping stalks and root them to make new plants? Ours is giant and we would like to get some more starts from it. Will this plant survive in water alone? I just purchased a Stromanthe Triostar at my local nursery and planted it outdoors in shade with dappled sunlight. I live in north central Louisiana. What can I expect from this plant? Will it be difficult to grow and thrive in my area? I have hosta, caladiums, Kimberly ferns, and hydrangea in the same outdoor area around the patio. What do I need to feed the Triostar? Thanks for the info. Thank you for all of the information! I have had my Stromanthe for a week now, and the leaves have curled in and won’t open back up. I’ve moved it around the house to find the most ideal spot for it and have kept it humid and evenly watered. What am I doing wrong? I just purchased one Thisbe past weekend. I noticed some leaves curling so I’ve been leaving my oil diffuser and humidifier on since I read they need high humidity. It looks happier to me.